Celebrating the life of Tony V. Moore, Jr.
Obituary for Tony V. Moore, Jr.
DURHAM: Tony Vinson Moore, Jr., age 51, of Durham, North Carolina passed away on Monday, March 25, 2019. 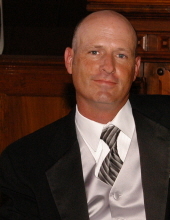 Tony graduated from Northern High School in 1985 and went on to attend Louisburg College. For 18 years, collectively, he worked for GTE, Verizon, and Frontier Communications, where he formed many lifelong friendships. Tony had a great sense of humor, a kind heart, and an unforgettable jump shot. Born in Durham on August 19, 1967, Tony was preceded in death by his maternal grandparents Earl and Annie Roberts, and his paternal grandparents Fred and Dessie Moore. Survivors include his parents Tony Sr. and Olivia Moore; brother, Jay Moore (Emily); and children Zach, Lauren, and Grace Moore. Tony was also survived by a number of aunts, uncles, cousins, nieces, and nephews who loved him very much. Tony formed a love for Duke basketball early on in his life and shared that passion with his family. He never missed a game and planned his schedules accordingly. He was also a devout Carolina Hurricanes hockey fan and enjoyed attending games with his children, when able. Tony had a deeply rooted love for music and was often known for sharing music with others that was ahead of his time. Tony’s one true passion, however, was his children. Tony spent countless hours watching and attending sporting events and concerts with his son Zach, throughout the last 27 years. Although his daughters did not reside in Durham, Tony loved visiting them in the Blue Ridge Mountains and cheering them on at their volleyball, basketball, and soccer games. He was a very proud father and supported his children in every way possible. Tony was someone who seized every opportunity to tell those he loved how much they meant to him, and he will be missed tremendously. Family and friends are invited to attend a memorial service and celebration of Tony’s life on Sunday, March 31 at Clements Funeral Home in Durham. Visitation will be held from 12 to 1:30pm, the service will be held from 2 to 3pm, and the burial will follow at Maplewood Cemetery. To send flowers or a remembrance gift to the family of Tony V. Moore, Jr., please visit our Tribute Store. "Email Address" would like to share the life celebration of Tony V. Moore, Jr.. Click on the "link" to go to share a favorite memory or leave a condolence message for the family.